We invite queries for a wide range of energy efficient White Westinghouse wine coolers, White Westinghouse chillers that are easy to install & operate. Featuring high functionality, low maintenance and less power consumption, these are electrically controlled with LED display. These are fitted with internal light, SS handle and SS door, and ensure less noise. Available in different technical specifications, these wine cooler and chillers are very useful for commercial usage and ensure maximum satisfaction. 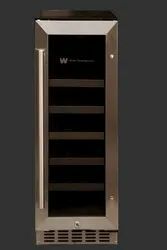 Our range of Wine Chillers sourced from White Westinghouse features LED display, reversible door, automatic defrost, 3 layer glasses door, 6 pulling wooden shelves, stainless steel door frame & handle, internal light and security lock & key. These ensure optimum performance with dual temperature zone ranging from 5 ~ 22 degrees Celsius with the capacity of 165 / 145 Litres and the wine storage of 46 bottles. Further, these require less maintenance and power consumption and are very useful for commercial usage. Packaging Details: We offer electrically operated Wine Coolers ? WC34DEX with special features like LED display, reversible door, automatic defrost, 3 layer glasses door, 6 pulling wooden shelves, stainless steel door frame & handle, internal light and security lock & key. It ensures optimum performance with dual temperature zone ranging from 5??? ~ 18??? 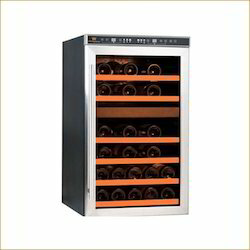 with the capacity of 138 / 115 Liters and the wine storage of 34 bottles. It requires low maintenance and low power consumption and is resistant to temperature and corrosion. Looking for White Westinghouse Wine Coolers ?